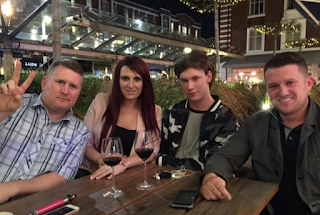 While Stephen Yaxley Lennon, who styles himself Tommy Robinson, languishes in jail, the task of imparting The Great Man’s word to us mere mortals in the outside world is undertaken by his closest supporters, that inner circle of friends and colleagues in whom he is able to place his trust. But as if to prove that there is no honour among thieves, that is where the latest falling-out has been - very publicly - taking place. 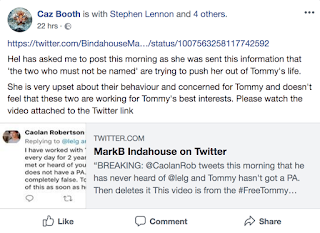 That is because Lennon’s former sidekick Caolan Robertson, who is in reality a vicious creep of no discernible principle, has been reduced to desperately trying to get a piece of the action, and in doing so has been very firmly told by Lennon’s real friends to shove off. Lennon has been moved from Hull prison, it seems, and at first, Caolan and Morphine appeared to have the right tale. 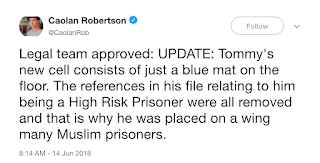 “Legal team approved: UPDATE: Tommy's new cell consists of just a blue mat on the floor. 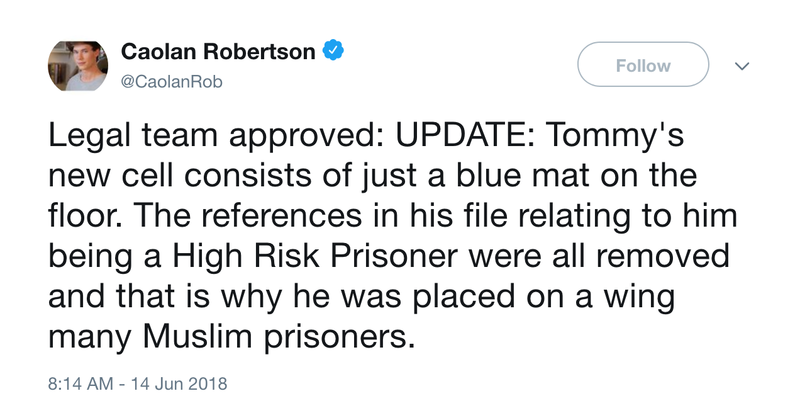 The references in his file relating to him being a High Risk Prisoner were all removed and that is why he was placed on a wing many Muslim prisoners”. Yes, he was the official channel! And there was more. 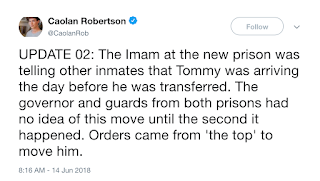 “The Imam at the new prison was telling other inmates that Tommy was arriving the day before he was transferred. 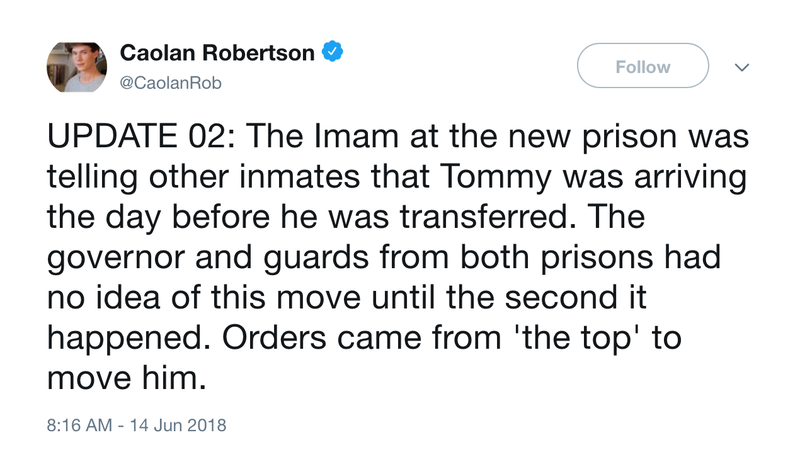 The governor and guards from both prisons had no idea of this move until the second it happened. Orders came from 'the top' to move him … Prisoners were banging on the walls 'all night' and screaming his name. 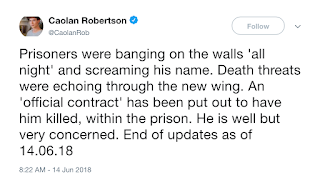 Death threats were echoing through the new wing. 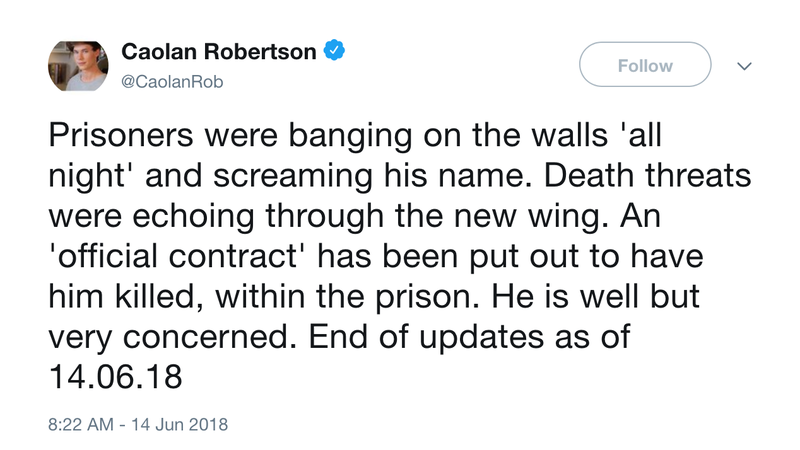 An 'official contract' has been put out to have him killed, within the prison. He is well but very concerned. End of updates as of 14.06.18”. How very dramatic. 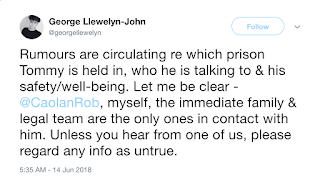 Moreover, Robertson’s pal George Llewelyn-John was there to back up the claims: “Rumours are circulating re which prison Tommy is held in, who he is talking to & his safety/well-being. 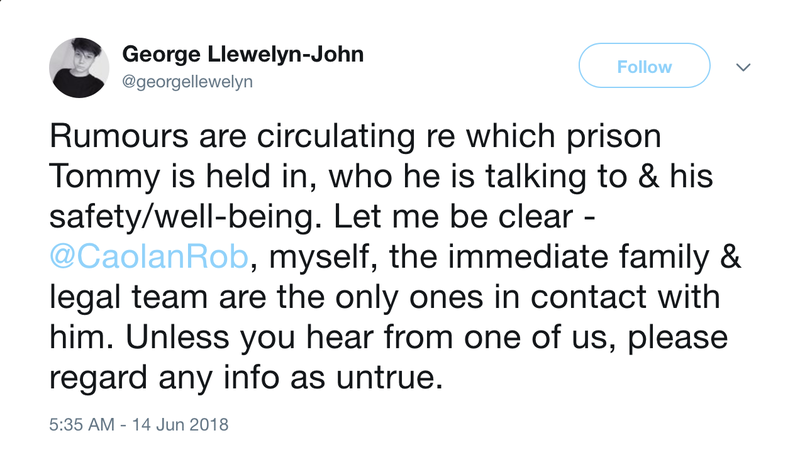 Let me be clear - @CaolanRob, myself, the immediate family & legal team are the only ones in contact with him. Unless you hear from one of us, please regard any info as untrue”. But he and Robertson had overreached themselves. But Caolan and Morphine was being seriously economical with the actualité. 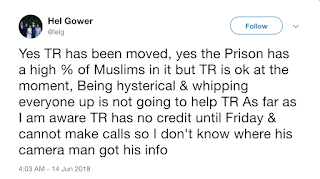 Lennon’s long standing PA Hel Gower also poured cold water on his claims: “Yes TR has been moved, yes the Prison has a high % of Muslims in it but TR is ok at the moment, Being hysterical & whipping everyone up is not going to help TR As far as I am aware TR has no credit until Friday & cannot make calls so I don't know where his camera man got his info”. 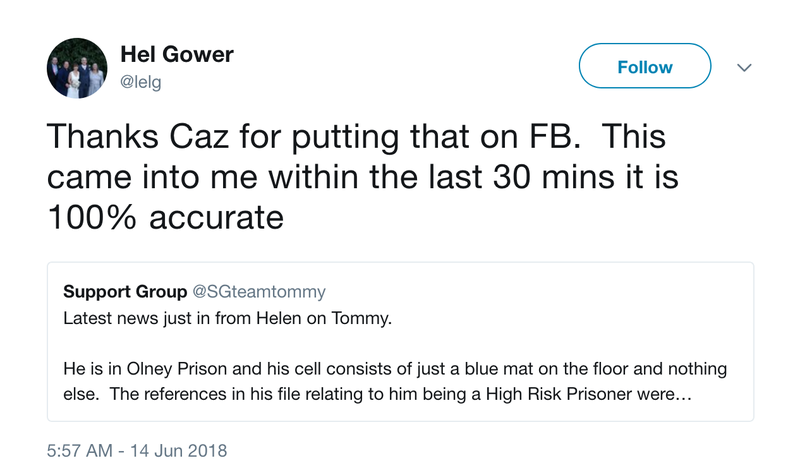 Then Robertson lost it, Tweeting to Ms Gower “I have worked with Tommy almost every day for almost 2 years and have never met or heard of you. He told me he does not have a PA. Your information is completely false. 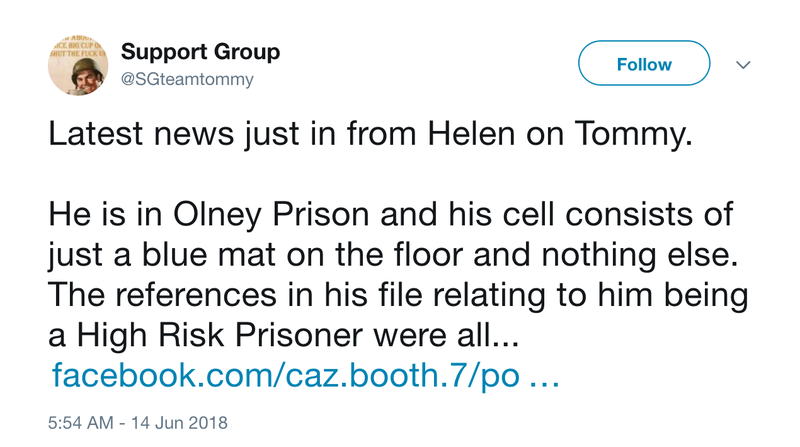 Tommy will clarify all of this as soon as he is released”. He was lying. And soon deleted the Tweet, but it was too late. 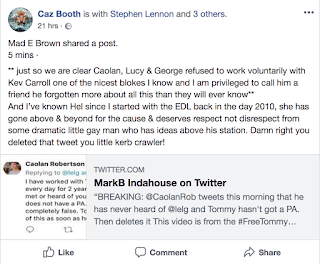 Meanwhile, it became obvious that Robertson was merely copying and pasting information from those who knew Lennon’s situation, including Caz Booth, who told “Latest news just in from Helen on Tommy. 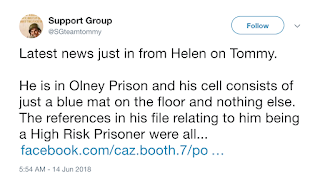 He is in Olney Prison and his cell consists of just a blue mat on the floor and nothing else”. What followed was what Robertson later cribbed. 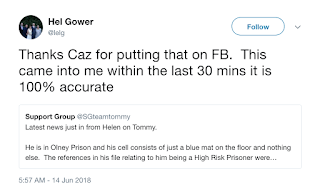 Ms Gower confirmed that this was a genuine source: “Thanks Caz for putting that on FB. This came into me within the last 30 mins it is 100% accurate”. She also confirmed “The team don't talk to Caolan and I regularly talk to the family as well as Tommy ringing me”. 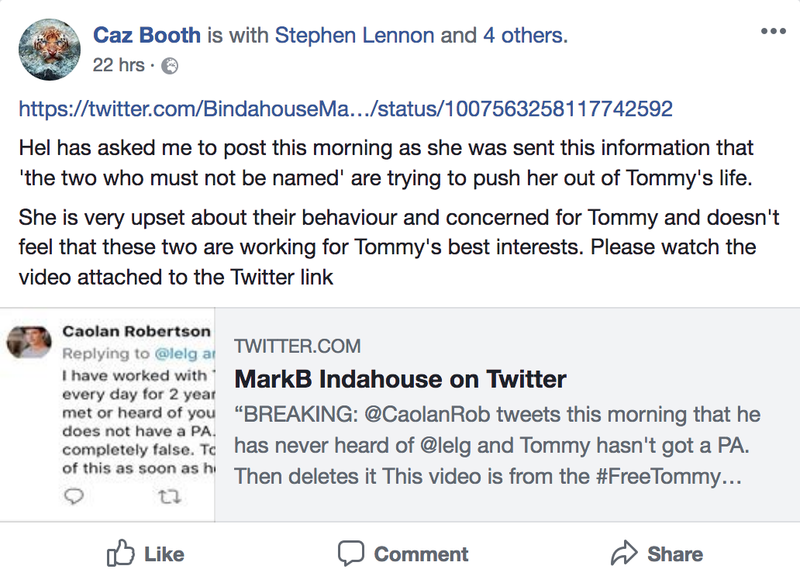 Meanwhile, the low regard in which Caolan and Morphine was held by Lennon’s real support group was laid bare on Facebook by Ms Booth: “Hel has asked me to post this morning as she was sent this information that 'the two who must not be named' are trying to push her out of Tommy's life. 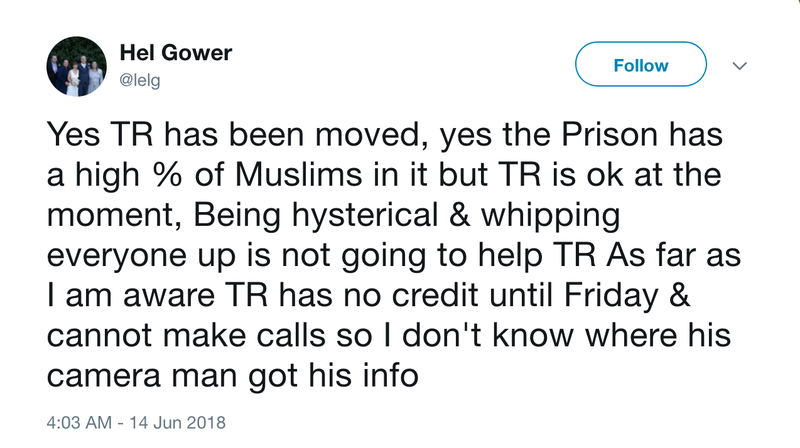 She is very upset about their behaviour and concerned for Tommy and doesn't feel that these two are working for Tommy's best interests. 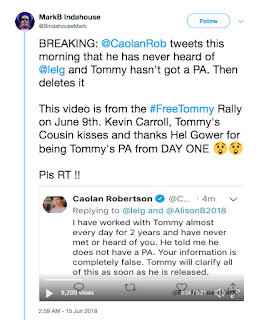 Please watch the video attached to the Twitter link” (which confirms Ms Gower is Lennon’s PA). And just to make sure that message got home, there was this message for Robertson: “just so we are clear Caolan, Lucy & George refused to work voluntarily with Kev Carroll one of the nicest blokes I know and I am privileged to call him a friend he forgotten more about all this than they will ever know. 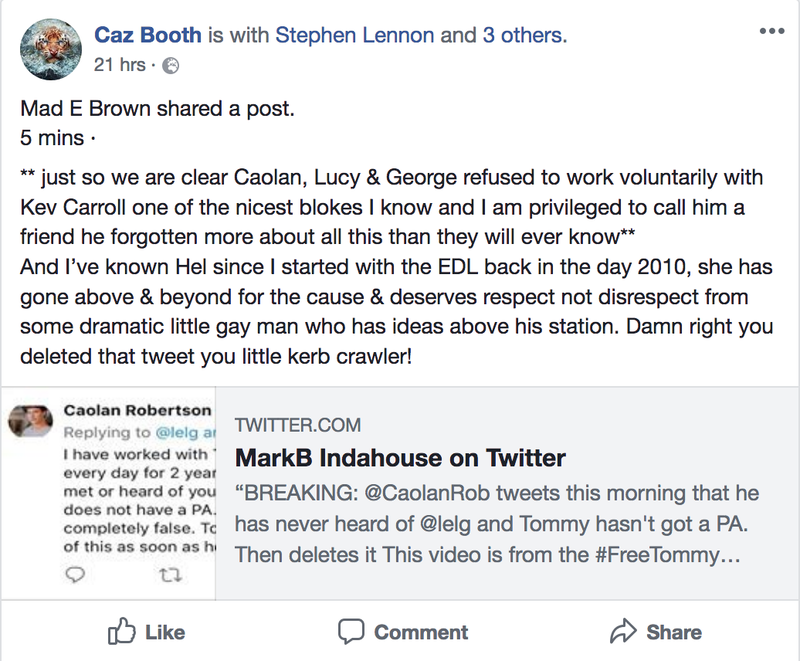 And I’ve known Hel since I started with the EDL back in the day 2010, she has gone above & beyond for the cause & deserves respect not disrespect from some dramatic little gay man who has ideas above his station. Damn right you deleted that tweet you little kerb crawler!” Over and out, eh? Caolan Robertson and his pal George Llewelyn-John have tried a little too hard to claim Stephen Yaxley Lennon as their own. All they have succeeded in doing is to stoke resentment and a growing annoyance among Lennon’s real supporters. And let anyone else know that they should not trust them any further than they can be chucked. I met Lucy Brown and Caolan in Poland whilst they were staying at the 5* Bristol Hotel. 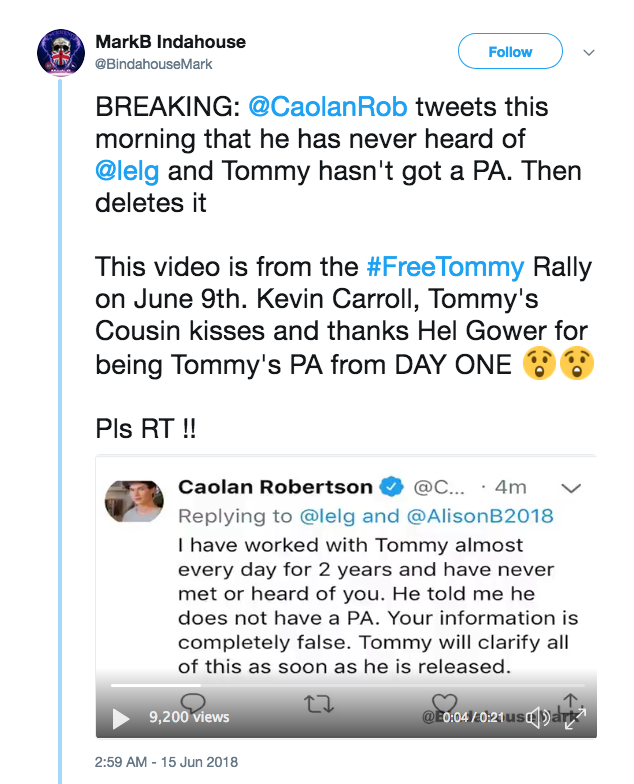 Caolan pulled no punches about how much he hated TR calling him a cocaine sniffing fake who take money from 'the working classes' for nefarious reasons. This was during the meeting with James Goddard/Lucy.